LBO Modeling is used to value a leveraged buyout (LBO)Leveraged Buyout (LBO)A leveraged buyout (LBO) is a transaction where a business is acquired using debt as the main source of consideration. An LBO transaction typically occur when a private equity (PE) firm borrows as much as they can from a variety of lenders (up to 70-80% of the purchase price) to achieve an internal rate return IRR >20% transaction where a target company is acquired using a significant amount of debt. The use of high leverage increases the potential returns on investors’ equity investments in the long-run. An LBO modelLBO ModelAn LBO model is built in excel to evaluate a leveraged buyout (LBO) transaction, which is the acquisition of a company that is funded using a significant amount of debt. The aim of the LBO model is to enable investors to properly assess the transaction earn the highest possible internal rate of return (IRR). 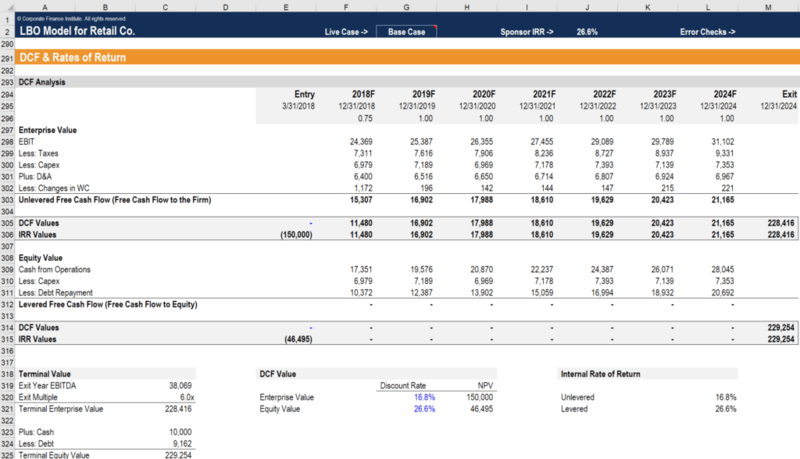 is usually built in Excel to help investors properly evaluate the transaction and realize the highest possible risk-adjusted internal rate of return (IRR)Internal Rate of Return (IRR)The Internal Rate of Return (IRR) is the discount rate that sets the net present value of an investment equal to zero. This guide to calculating IRR will give several examples and who why it's used in capital budgeting, private equity and other areas of finance and investing. If IRR is greater than cost of capital,. Corporate Finance Institute® covers LBO modeling and transactions in-depth in our Leveraged Buyout (LBO) Financial Modeling Course! Before building the LBO model, necessary assumptions need to be made on inputs including financing, operating metrics of the business, sources and uses of cash, purchase price allocation, and operating scenarios. Excel functions and formulas can be used to set up a drop-down list so that different results will be reflected in the later sections (such as the DCF model) as different scenarios are chosen. Once all the assumptions are laid out, the income statementIncome StatementThe Income Statement (or Statement of Profit and Loss) shows performance from operations of a business. The financial statement begins with revenues and, balance sheetBalance SheetThe balance sheet is one of the three fundamental financial statements. These statements are key to both financial modeling and accounting. The balance sheet displays the company’s total assets, and how these assets are financed, through either debt or equity. Assets = Liabilities + Equity and cash flow statementCash Flow Statement​A Cash Flow Statement (officially called the Statement of Cash Flows) contains information on how much cash a company has generated and used during a given period. It contains 3 sections: cash from operations, cash from investing and cash from financing. are constructed and linked using historical data. Supporting schedules such as working capitalWorking Capital FormulaThe working capital formula is current assets minus current liabilities. The working capital formula measures a company’s short-term liquidity and tells us what remains on the balance sheet after short-term liabilities have been paid off. Working capital can be positive or negative and is used for managing cash flow and depreciation schedulesDepreciation ScheduleA depreciation schedule is required in financial modeling to forecast the value of a company's fixed assets (balance sheet), depreciation expense (income statement) and capital expenditures (cash flow statement). In financial modeling, a depreciation schedule is requried to link the three financial statements in Excel are also built to calculate the corresponding line items on the financial statements. ForecastingForecasting MethodsTop Forecasting Methods. There is a wide range of frequently used quantitative budget forecasting tools. In this article, we will explain four types of revenue forecasting methods that financial analysts use to predict future revenues. Four Types of revenue forecasting include straight-line, moving average, regression is then performed on the three financial statementsThree Financial StatementsThe three financial statements are the income statement, the balance sheet, and the statement of cash flows. These three core statements are intricately linked to each other and this guide will explain how they all fit together. By following the steps below you'll be able to connect the three statements on your own. based on the assumptions set up. Before completing the full forecast on the financial statements, a transaction balance sheet needs to be built to show the pro forma balance sheet items after recapitalizationRecapitalizationRecapitalization is a type of a corporate restructuring that aims to change a company’s capital structure. Usually, companies perform recapitalization to make the capital structure more stable by exchanging one type of financing for another. One example is when a company issues debt to buy back equity shares.. The transaction balance sheet lays out the total adjustments and capital structureCapital StructureCapital Structure refers to the amount of debt and/or equity employed by a firm to fund its operations and finance its assets. The structure is typically expressed as a debt-to-equity or debt-to-capital ratio. Debt and equity capital are used to fund a business’ operations, capital expenditures, acquisitions, of the business after the LBO transaction is completed. The closing pro forma balance sheet will flow back up to the balance sheet section to drive the forecasts. The debt and interest schedulesDebt ScheduleA debt schedule lays out all of the debt a business has in a schedule based on its maturity and interest rate. In financial modeling, interest expense flows into the income statement, closing debt balance flows onto the balance sheet, principal repayments flow through the cash flow statement, completing the scheudle model the details of all layers of debt and interest payments associated with the LBO transaction, including line of credit, term loansSenior Term DebtSenior Term Debt is a loan with a senior status that has a set repayment schedule and a bullet repayment at the end of the term. The schedule can be over several months or years, and the debt may carry a fixed or variable interest rate. To reduce repayment risk, fixed assets are frequently used as collateral and subordinated debtSenior and Subordinated DebtIn order to understand senior and subordinated debt, we must first review the capital stack. Capital stack ranks the priority of different sources of financing. Senior and subordinated debt refer to their rank in a company's capital stack. In the event of a liquidation, senior debt is paid out first. With the debt schedules completed, the rest of the linking can be done for the financial statements. The credit metrics evaluate the repayment profile and look at how the company can service its debt obligations, including repayment of principles and interest. Key credit metrics in an LBO model include debt/EBITDADebt/EBITDA RatioNet debt to earnings before interest, taxes, depreciation, and amortization (debt/EBITDA ratio) is a measure of financial leverage and a company’s ability to pay off its debt. Essentially, the net debt to EBITDA ratio gives an indication as to how long a company would need to operate at its current level to pay off, interest coverage ratioInterest Coverage RatioInterest Coverage Ratio (ICR) is a financial ratio that is used to determine the ability of a company to pay the interest on its outstanding debt. The ICR is commonly used by lenders, creditors, and investors to determine the riskiness of lending capital to a company. The interest coverage ratio is also called “times, debt service coverage ratio and fixed charge coverage ratioFixed-Charge Coverage Ratio (FCCR)The Fixed-Charge Coverage Ratio (FCCR) is a measure of a company’s ability to meet fixed-charge obligations such as interest and lease expenses. The FCCR is a broader measure of the times interest coverage ratio, as it also includes other fixed costs such as leases and insurance. A higher FCCR value is preferred..
At the end, a DCF modelWalk me through a DCFThe question, walk me Through a DCF analysis is common in investment banking interviews. Learn how to ace the question with CFI's detailed answer guide. Build a 5-year forecast of unlevered free cash flow, calculate a terminal value, and discount all those cash flows to present value using WACC. is built with the forecasted data. The free cash flows are calculated for each of the investor types, which are then used to find out internal rates of return (IRR)Internal Rate of Return (IRR)The Internal Rate of Return (IRR) is the discount rate that sets the net present value of an investment equal to zero. This guide to calculating IRR will give several examples and who why it's used in capital budgeting, private equity and other areas of finance and investing. If IRR is greater than cost of capital, and net present value (NPV)Net Present Value (NPV)Net Present Value (NPV) is the value of all future cash flows (positive and negative) over the entire life of an investment discounted to the present. NPV analysis is a form of intrinsic valuation and is used extensively across finance and accounting for determining the value of a business, investment security, by investor type. Following the DCF model, sensitivity analysisWhat is Sensitivity Analysis?Sensitivity Analysis is a tool used in financial modeling to analyze how the different values for a set of independent variables affect a dependent variable under certain specific conditions. Sensitivity Analysis is performed in Excel to asses risks, measure potential outcomes, and plan for an uncertain future can be performed to assess how the IRR will be affected when different independent variables change, holding all other assumptions unchanged. Finally, charts and graphs can be created to present the change in cash flowsFree Cash Flow (FCF)Free Cash Flow (FCF) measures a company’s ability to produce what investors care most about: cash that's available be distributed in a discretionary way and the amount of leverageLeverageLeverage is a strategy that companies use to magnify returns, though it may also magnify losses. To increase Financial Leverage, a firm may borrow capital through issuing fixed-income securities (preferred equity and debt). Operating Leverage can be attained through fixed operating expenses. over time. CFI offers many more resources that can help you expand your knowledge and further your career. Check out some of these resources below, including a course that can help you learn to model LBO transactions in more detail! LeverageLeverageLeverage is a strategy that companies use to magnify returns, though it may also magnify losses. To increase Financial Leverage, a firm may borrow capital through issuing fixed-income securities (preferred equity and debt). Operating Leverage can be attained through fixed operating expenses.